B-CC’s International Baccalaureate diploma program maintains an open admissions policy. Students do not have to test in, or meet any entrance requirements to be enrolled in the program. In addition, B-CC students can choose to be either a full diploma candidate and take the full complement of required courses, or a certificate candidate and take only the IB courses that they are interested in. Students make their selection in the spring of their sophomore year. The academically rigorous, world-recognized International Baccalaureate program started at B-CC in 1996, the result of a community initiative to retool and re-engineer B-CC High School. A group of staff, parents, and concerned citizens from all sectors of the B-CC community had formed the Community Coalition of B-CC High School (CC B-CC) in 1994, in response to the effects of steep cuts in the County’s school budget on B-CC. The group spent a year researching, surveying, and conducting educational forums and a retreat, culminating in a new initiative, “Stand Up for B-CC 2000”, to bring B-CC High School into the 21st century amidst an increasingly urban and cosmopolitan environment. B-CC’s open IB diploma program was part of that new initiative. The “open-access” model reflects the philosophy of the B-CC community – students should be given opportunities to stretch themselves to reach their academic potential. 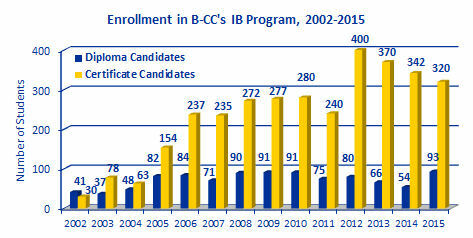 B-CC’s program was the first open-access IB program in the Montgomery County Public Schools system. Its success led other schools in the County, including Springbrook, Einstein, Watkins Mill, Rockville, Kennedy, and Seneca Valley High Schools, to follow B-CC’s lead and establish open IB programs of their own a few years later. The B-CC High School Educational Foundation played a critical role in helping B-CC’s IB program gain its footing during those first few years when there were limited funds available from the County. It provided much-needed grants to the program for curriculum materials and teacher training. It was not until the fall of 2001 that the program received a significant infusion of funds from the County, enabling it to operate for the first time with a full-time coordinator. $1,500 in the spring of 2003 for the first IB expo. an accompanist for the live public performances required of IB music students since the fall of 2010. In addition, the Foundation has funded summer and after-school academic support programs for IB students to ensure that they have the extra help they need to meet the challenges in the IB classes. The first such grant was $1,500 for an IB preparatory program in the summer of 2005 for students entering the IB diploma program who might need extra support. Since then the Foundation has provided funds for after-school tutorial support for all AP/IB students in English, Science, and Social Studies; brown bag lunchtime seminars to help new and/or struggling IB students; as well as continuing summer support for incoming juniors newly registered for AP or IB classes to help them successfully make the transition to these higher level classes. In FY2014, the Foundation funded, for the 4th year in a row, the annual subscription of ManageBAC, a software package used by diploma students, the CAS coordinator, and the diploma coordinator. It also continued to pay for the annual subscription to Questia, a web-based database of periodicals and texts used by diploma students. From 2002-2013, the IB diploma program has received supplemental funding from the Foundation totaling over $48,500. Of these, 49% were for equipment and software, 25% for tutoring and mentoring, and 27% for teacher training. * Projected enrollment figures for 2014 and 2015. Find out more about the Foundation and its programs via these videos. Find out more about the programs that the Foundation has funded. The Foundation’s Campaign for Academic Excellence provides a continuum of year-round integrated academic support and enrichment programs that promote high academic standards and success for all students at B-CC High School. The Bethesda-Chevy Chase High School Educational Foundation was established in 1995 during a time of declining enrollment and deteriorating facilities at B-CC High School. The Foundation took on the charge to help improve school facilities, raise academic rigor, and re-engineer B-CC for the 21st Century. By the summer of 2018, the Foundation has raised more than $2.9 million to meet that challenge and has been investing in academic excellence at B-CC High School for more than two decades. 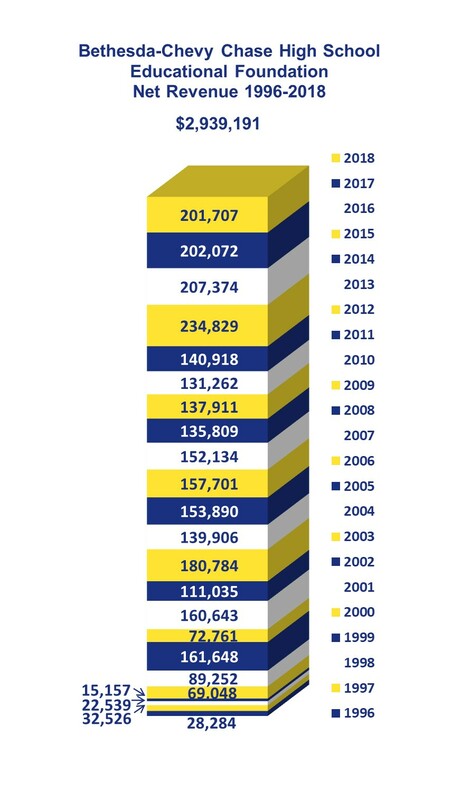 With new programs and a newly modernized facility that was completed in February 2002, B-CC’s enrollment, reflecting community confidence in the school, has been increasing steadily ever since, from 1,076 students in 1995 to 2,096 students in 2018. B-CC H.S. Educational Foundation, Inc.